Despite its name, winter squash is in season now! It’s called winter squash because unlike its summer cousin, winter squash has a thick rind that allows it to keep for long periods of time. Winter squash harvested in late summer and early fall can last through to winter. What else makes winter squash different from summer squash? Have you ever had a zucchini or crookneck squash that tasted (and smelled!) especially squash-y? It probably had large seeds and thick skin too. Summer squash and winter squash are from the same family of vegetables; the difference is that summer squash tastes best when harvested young and winter squash tastes best when harvested at full maturity. That’s why a zucchini or crookneck squash left to grow too large isn’t as tasty as one that’s picked when it’s still small. How do you choose a good winter squash? Winter squash is pretty easy to pick–it doesn’t bruise or blemish easily. Your squash should feel heavy and it shouldn’t have any soft spots. How is winter squash stored? Store it in a cool, dry place–don’t refrigerate it! At 50 degrees, some varieties of winter squash can last up to 6 months. Since most of us don’t have root cellars underneath our houses, that’s probably not a possibility. When kept on the countertop or in your pantry, you’ll want to use most varieties of winter squash within 2-3 months. Why should you eat winter squash? It’s super good for you! It’s high in fiber and contains healthy doses of Vitamins A, C, and B6, along with potassium and antioxidants. It’s low in calories too, which is always nice, right? What kinds of winter squash are there? Ambercup // A relative of the acorn squash. Its sweet flesh is great in soups or oven-roasted. Delicata // A sweet winter squash with edible rind. Sweet Dumpling // Another relative of the acorn squash. It’s the perfect size and shape for stuffing, although it’s also great cut into wedges or rings and roasted, like in this recipe. Acorn // Good in soup, but definitely best roasted or stuffed. Rind is edible, but can be tough. Spaghetti Squash // After roasting, scrape the flesh out of the spaghetti squash and serve it like pasta. This recipe from Once Upon a Cutting Board is one of my favorite ways to use it. Buttercup // This sweet squash is perfect roasted, pureed, or added to soups. Butternut // Butternut squash has a tough rind, so it’s best to remove it (although it is edible!). It can be used as a low-calorie replacement for sweet potatoes in many recipes. It’s incredibly versatile and tastes great roasted, pureed, as soup, and even in sandwiches. How do you prepare winter squash? Some winter squash should be peeled (butternut and spaghetti are two examples), while others have edible skin (like delicata and sweet dumpling). Squash with inedible skin can either be peeled before cooking or after. All squash should have pulp and seeds removed before cooking. While winter squash can be steamed or even sauteed, I prefer to roast it. You can cut it in half, into cubes, into rings or into wedges and bake at 400 degrees for 40-50 minutes. It’s great with maple syrup, rosemary, cinnamon, maple syrup, or smoky chipotle peppers. What’s your favorite thing to do with winter squash? This is such a great post. Thank you for schooling me on squash. I can’t wait to get my fingers dirty and make some winter squash. I love a roasted squash with garlic. Spaghetti squash dressed up with fancy balls of meat is nice. Acorn squash as bowls? Oh yes please! Winter squash is one of my favorites, I gleefully prepare it any way I can think. My family is usually tired of it FAR before I am. What a great post! I adore the graphic. 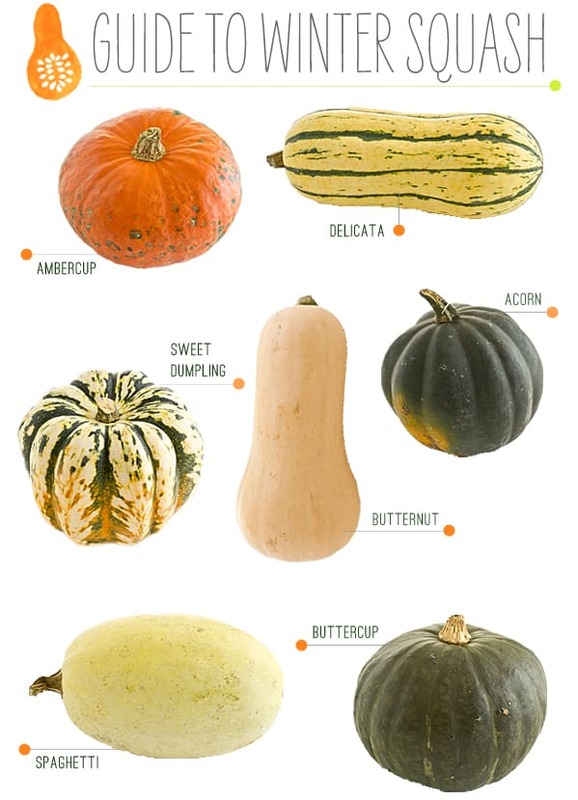 I’m a huge fan of spaghetti, delicata, and butternut squashes, but haven’t come around to acorn (or its cousins) yet. Maybe I just haven’t prepared it well. The first time I tried acorn I didn’t like it either. I found it to be bland. But I’ve definitely come around and now it’s one of my favorites! Girl, this is such great information! I learned about acorn squashes last year when I kept getting them in my CSA box – I roasted them with some sort of stuffing mixture and it was divine. And I’d never had a butternut until I cooked one for Caroline as a baby. Most of my veggies as a kid were from a can, sad, huh? Yeah, mine too. I can’t even look at canned veggies anymore. Well, tomatoes are okay. But canned green beans and peas give me flashbacks. Thanks for the guide! If you can believe it, I have never tried any of the winter squashes. You should give them a try! 😀 Butternut squash is probably a good one to start with–it tastes kind of like a less-sweet sweet potato. Here is the recipe of Pumpkin Jam with Orange. Yummy! I will go check it out–thanks! I’m telling you I squealed with happiness when I saw that Delicata’s were at my farmers market. I’ve probably gone through 10lbs of it myself. Great info! Thank you so much for this. Great post on winter squash! I just bought a kabocha squash which is similar to buttercup today. Kabocha is my favorite kind of winter squash. You can eat the skin! Makes it so much easier to prepare than the others. And it has a lovely nutty savory-sweet flavor. Sometimes it’s a little dry, so I prefer to use it in moist dishes (with sauces). YUM! Glad you posted this! A friend of mine gave me some squash from her garden, but I had no idea what kind it was. Apparently, based on your photo, she gave me Ambercup! 🙂 Cannot wait to make something yummy with it all. Ha! I’m glad I could help. 🙂 I’m sure you will make something delicious with it! What makes a butternut rind ‘inedible?’ I literally eat butternut several times a week and I always eat the skin. Ahh I love this. Winter squashes are some of my favorite veggies 🙂 I usually hoard them when I see them at the market… Which should be soon – yay! I can’t wait to eat winter squash! I love using butternut squash and spaghetti squash in place of pasta but I think this fall I need to branch out and try some of the others you have listed here! Acorn, butternut and spaghetti are my favorites! I have 2 acorn squashes waiting to be cooked from my mom’s garden. I only discovered squash about 2 years ago, can you imagine?! It was not a typical vegetable I was raised eating. perfect timing for such a perfect post! thank you. I can’t find any creativity around squash, so this is such a great resource. My CSA crate is coming squash-heavy and I want to make sure I use it well. so thanks again! Delectica is my favorite, it is the perfect size for my husband and I, and it is not too strong tasting. LOVED this post — had no idea how long winter squash could be kept! Thank you! It’s so fun to experiment with all the different kinds, isn’t it? This is a great guide! I’d love for you to join my “Do Your Thing” link party! Yay for winter sqash! I love them all, too, but kabocha is by far my favorite. Butternut is a close second. 😉 Off to pin this–thanks! Butternut squash. Slice in half from top to bottom and scoop out seeds. Place cut side down in a baking pan or a casserole dish and add 1/2 inch of water. Cover with foil for the oven or plastic wrap for the microwave. Cook @ 350 degrees for the oven or on high for the microwave. After 45 mins to 1 hr test for doneness by pushing on the thickest part. If soft turn right side up and drain all water. Score the squash and spread with butter then put brown sugar on top. Cook for 10 mins and serve.